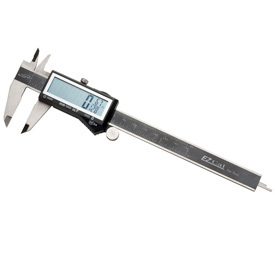 This hardened stainless steel digital caliper lets you select between fraction, millimeter, and decimal display with the press of a button. Comments On Jun 14, 2017:After using and abusing this Caliper I decided it was time to review. My conclusion is that if it can take my abuse then you should have one two. I've put it through many drops, much dust and wet wood sap and it works great still after 2 years. I received this as a Father's Day gift and use it when precision and repeatability is needed. Comments On Jan 08, 2013:I am very inpressed with the quality of this caliper. I wanted one to read fractions and decimals the mm was a bonus. It is well built and easy to read.